With the Orioles and Nationals preparing for a three-game set this weekend, here are some historical anecdotes involving players to have taken the field for franchises in Baltimore and Washington. -Leslie Ferdinand “Buster” Narum pitched for both the Orioles (1963) and Senators (1964-1967). The pitcher shares with Lou Montanez the distinction of being the only Orioles to hit home runs in their first major league at-bats. Narum did so on May 3, 1963, Montanez on Aug. 6, 2008. Narum had a career .059 average with three home runs in 118 career at-bats. The Orioles traded him to the Senators prior to the start of the 1964 season for a player to be named later. That player was Lou Piniella, who played four games for the Orioles in 1964 and went hitless in one at-bat. A vagabond early in his career, Piniella was named American League Rookie of the Year in 1969 while playing for the Kansas City Royals. –John Orsino played three seasons in Baltimore (1963-1965) and parts of two seasons in Washington (1966-1967). Two things stand out from Orsino’s brief career. 1. He homered in his first five Spring Training at-bats for the Orioles. 2. He was the catcher on Sept. 12, 1964 when both starting pitchers tossed one-hitters. Orsino had the Orioles’ only hit in the 1-0 victory over the Athletics. 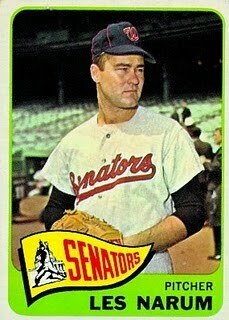 -The Orioles traded Mike Esptein and Frank Bertaina to the Senators for Peter Reichert in 1967. The Sporting News named Epstein Minor League Player of the Year in 1966. He also earned International League Player MVP honors that season after batting .309 with 29 home runs and 102 RBI. However, his path to the majors was blocked at first base by Boog Powell and efforts to convert him to an outfielder failed. He was traded at the end of May after refusing to report back to the minors. Epstein got a measure of revenge on June 24, 1967, by hitting a grand slam in his first at-bat against the Orioles in an 8-3 Senators victory at Memorial Stadium. -Outfielder Roy Sievers never made it to Baltimore in 1954 when the St. Louis Browns relocated. The Orioles traded Sievers to Washington on Feb. 18, 1954, for Gil Coan. Sievers, the 1949 A.L. Rookie of the Year with the Browns, was a four-time All-Star (five if you count the fact that he played in both games in 1959). Coan, the 1945 Sporting News Minor League Player of the Year, appeared in 155 games with the Orioles during the 1954 and 1955 seasons before being selected off waivers by the Chicago White Sox. Coan holds the record for most at-bats in a season hitting .500 or better with 42. He set the mark while appearing in 11 games in 1947.